The revised plans for Genoa Baptist Church. Four public hearings were heard at Monday’s Genoa Township Zoning Commission meeting on April 8, resulting in three continuances. 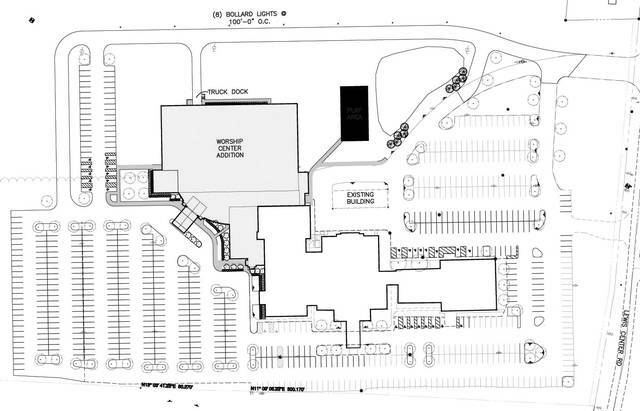 Genoa Baptist Church at 7562 Lewis Center Road in Westerville was seeking an addition that would expand its auditorium from seating 800 to accommodating 1,500 worshipers. Representatives said this would necessitate a building height of 46 feet, and the township says no building shall be more than 35 feet high. The church also wants to make a more visible main entrance. Finally, there would be changes to parking and landscaping on the 87.8-acre property, but no added access points along state Route 3. Public comment was mixed. Several people praised the church, which has experienced continuous growth since its founding in 1988, and now includes a school. However, more people spoke against the church. Residents across from the church on Lewis Center Road said lights from the parking lot, signage, and vehicle headlights exiting the church light up the rooms of their homes at night. Screens and trees were promised to alleviate the problem, but has not been done. “I want some help,” said one woman, who noted that her dog was getting spooked by the moving headlights exiting the church drive. Drawings dated from 2014 show that a mound would be used as a screen. There is currently a mound behind the church, but it is not along Lewis Center Road. Residents said the present mound was unsightly and a pond created a problem with mosquitoes. One resident also said there is a trash pickup around 2-2:30 a.m. Tuesday mornings that wakes them up. Commission members had concerns of their own, such as the increased height of the church in the plans and the need for a more obvious entrance. “No one is confused there is a church there,” said member Sandra Faulkner. The commission voted unanimously for a continuance to revisit Genoa Baptist’s application May 13. First heard on Jan. 14, the construction of a child care center on a vacant lot at 5940 Chandler Court in Westerville was also given a continuance until May 13. The other continuance was for the Hawks Nest at Hoover subdivision on 4461-4485 South Old 3C Highway. Applicant Patrick Shivley Sr. said for two years he unsuccessfully farmed the nearly 26 acres and is now seeking to build 29 single-family homes on the property, which has a sliver of Hoover Reservoir frontage. Shivley said residents would be allowed to use kayaks or paddle boards in Hoover from the property. Public comment was in support of rezoning the Rural Residential (RR) property to a Planned Residential District (PRD). Shivley was praised for his patience and addressing residents’ housing density concerns. One speaker said they hated to see the open space go, but this was a good use for the former vacant farm. No divergences were requested, but the commission said there was too much information to review in one sitting with short notice, and members requested the continuance. One application was approved — Vinmar Village phases 4-6; which is 71 single-family homes on three parcels just north of the present Vinmar Village along South Old 3C, with a Galena zip code. The homes on the nearly 75 acres of vacant farm land adjacent to Genoa Trail will look similar to what is in Vinmar Farms and phases 1-3 of Vinmar Village, with access from Olivero Drive. A Del-Co Water tower will also be placed on the northwest corner of the site. The development is in the Big Walnut Local School District. The Delaware County Regional Planning Commission gave conditional approval to rezoning from RR to PRD in 2017. Representatives asked for a resolution to issues that diverged from the township’s revised comprehensive plan, such as the width of trees and kiosk-style mail boxes. The commission members worked through the issues before voting to approve the final development plan. The plan next goes before the township trustees. In other business, Mark Antonetz was voted chair of the Zoning Commission, and David Leff was voted vice chair. https://www.delgazette.com/wp-content/uploads/sites/40/2019/04/web1_Genoa-Church-Revised-Prelim-Landscape-3-11-19-Plan-View-22-x-34.jpgThe revised plans for Genoa Baptist Church.